FILE - German Chancellor and top candidate of the Christian Democratic Union, CDU, Angela Merkel speaks during an election campaign in Delbrueck, western Germany, Sept. 10, 2017. By the standards of this year’s raucous French vote, and Britain’s rowdy one last year, Germany’s federal election campaign has been staid and predictable. With two days left before polls open, Angela Merkel appears to be cruising to her fourth term as the country’s chancellor. Aghast at the Brexit vote and Donald Trump’s election in the United States, Germans are in no mood to gamble. Pre-vote surveys show they yearn for things to remain as they are — stable and, for most Germans, affluent. The cautious chancellor has played to her strengths — and to the mood of an electorate adverse to upsets. Her main center-left challengers, the Social Democrats, are already preparing themselves for a dismal showing, possibly heading to secure their lowest share of the national vote since 2009. A screen that shows the TV debate between German Chancellor Angela Merkel of the Christian Democratic Union (CDU) and her challenger Germany's Social Democratic Party SPD candidate for chancellor Martin Schulz in Berlin, Germany, Sept. 3, 2017. Their lackluster campaign, in which they were never able to differentiate themselves from their senior partner in the governing coalition, Merkel’s Christian Democrats, never had much of a chance against a deft chancellor at the peak of her sure-footed political game. Nonetheless the rest of Europe will be watching closely as the Germans head to the polls Sunday. First, it remains unclear what kind of coalition Merkel will set about trying to form after the votes have been counted. The final make-up will have major implications for the kind of far-reaching reforms French President Emmanuel Macron is advocating for the European Union. Especially if she has to include the revived pro-market Free Democrats, who have rebranded under their charismatic leader, the 38-year-old Christian Lindner, and are now opposed to greater EU political integration and centralization. 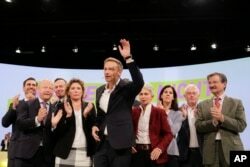 Lindner has made it clear that for the Free Democrats there will be red line in coalition talks. His party will refuse to endorse a common budget for the eurozone as advocated by the French president. 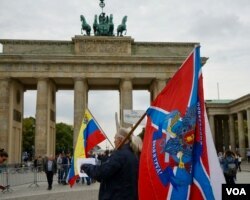 And, second, Europeans will be watching to see how Germany’s far-right right Alternative for Germany (AfD) fares, trying to work out whether the continent has reached high tide when it comes to anti-immigrant, anti-EU populist insurgencies or is still in the middle of an unsettling storm. All the signs are that AfD will do well and break the vote threshold required to be awarded seats in the Bundestag. It could end up with 60 to 85 lawmakers and become Germany’s third largest party after the Christian Democrats and Social Democrats. It would mark the first time reactionary nationalists have sat in Germany’s parliament since the Nazis razed the Reichstag in 1933. AfD’s arrival from the fringes of German politics to the heart of power in Europe’s most powerful capital will revive the spirits of European populists, who had high hopes this year of seeing a populist somewhere returned to power in western Europe. Marine Le Pen’s defeat to Emmanuel Macron in the French presidential election, and Geert Wilders low 13 percent score in the Dutch polls in March shattered those hopes. AfD lawmakers sitting in the Bundestag would be a substantial consolation prize and a remarkable accomplishment for a party formed only four years ago in protest at the EU bailout of the bankrupt Greece. Merkel has tried to blunt the AfD’s appeal. She launched her campaign in June using the black, red and gold colors of the national flag as a backdrop — an unusual move for a mainstream leader in a country still haunted by its Nazi past and nervous about open expressions of patriotism. After the voting results, Merkel may elect to try to form a governing coalition without the Social Democrats, say party insiders, in order to stymie the populists. 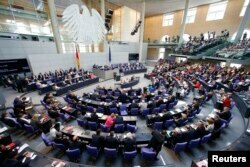 If the Social Democrats are in the coalition, the AfD, which began life as an eccentric, slightly whacky free-market party and transformed itself into a muscular populist anti-immigrant group, would become formally the largest opposition group in the Bundestag, entitling it to some significant parliamentary powers, including chairing the influential budget committee and opening budget debates. Having such powerful perks in the Bundestag would give the AfD a platform most established parties want to deny them. FILE - Gregor Gysi of the German left-wing Die Linke party makes a speech during a session of Germany's parliament, the Bundestag, in Berlin, Germany, July 17, 2015. The oddest aspect of the three-month election campaign has been the contrast between the party leaders. The taciturn Merkel has lived up to her nickname Mutti. 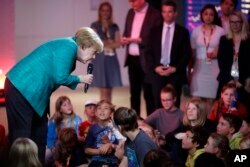 German Chancellor Angela Merkel, left, attends a news conference for children during a family event of her Christian Democratic Union party in Berlin, Sept. 17, 2017. In August she went into great detail about how she likes to make potato soup. “I always pound the potatoes with a potato masher, not a blender. Then there'll always be a few lumps left,” she said. 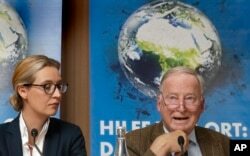 Alice Weidel, left, and Alexander Gauland, right, top candidates of the German AfD (Alternative for Germany) party for the upcoming general elections, attend a press conference in Berlin, Germany, Monday, Aug. 21, 2017. One of the two AfD leaders, Alice Weidel, is hardly as down-home as Merkel and appears more like a member of the global elite she lambasts. A former investment banker, she is a lesbian, lives in Switzerland — for tax reasons — with a partner from Sri Lanka and has been accused of illegally hiring a Syrian refugee as a house cleaner.